Facial Protection Mask. SHARK, the protective instinct. Since the creation of SHARK, we make it a point of honor to increase safety in our products. Our R&D office pushes research limits above the usual to reach the best possible performance. Evoline 1/2/3. Genuine Clear Shark Visor. Moto Central: Shark VZ160 Dark Smoke Visor ( 272/VZ16017PFU). Shark Skwal. Shark Spartan. Shark Spartan Carbon. This is the darkest tint available on a genuine Shark visor. The similarities are clearly visible. First and foremost its aerodynamics are optimized, giving it better performance and sleeker looks. Pinlock Ready Visor. SHARK, the protective instinct. Since the creation of SHARK, we make it a point of honor to increase safety in our products. It is the perfect combination of compactness and great looks. Facial Protection Mask. SHARK, the protective instinct. Since the creation of SHARK, we make it a point of honor to increase safety in our products. Shark Spartan Carbon Skin DWS Full Face Motorcycle Motorbike Helmet | Condition is New with tags and boxed. Pin lock visor included. One thing to note is that the LED system can be switched off. SHARK, the protective instinct. Since the creation of SHARK, we make it a point of honor to increase safety in our products. Our R&D office pushes research limits above the usual to reach the best possible performance. 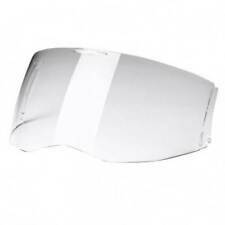 The visor automatically lifts when the chin guard is lowered or raised in perfect sequence. The sunshield in 23% larger than that on the Evoline model for extra protection. Five year warranty. Auto-up and auto-down system for chin guard and visor. Light surface wear to the goggles otherwise in good condition. PINLOCK ANTI FOG INSERT FITS SKWAL AND SPARTAN (VZ16012P) The anti-fog insert uses a moisture absorbing plastic and a silicon seal, the insert will create a airtight double visor, giving the best anti-fog system available. The anti-fog insert is securely fastened between 2 pins. Fitting is easy and you can change your colour with changing weather conditions. Shark vision r helmet. Condition is Used. Dispatched with Royal Mail 2nd Class. •SHARK SKWAL HELMET• *FOR SALE* Condition as New, worn once - Size M - Includes - Box, Helmet bag, Fog resistant lens, reflective stickers, DVD manual, LED charging lead - 5 year warranty with SHARK registered in March 2017 - Contemporary design and look - Vents to crown and chin - Auto seal system visor with sunshade visor incorporated into the design - LED lights in chin, centre front and reverse with a on/off button under edge Please share! Dispatched DHL Next day - price tbc- ignore postal info on listing. Will also accept collection. 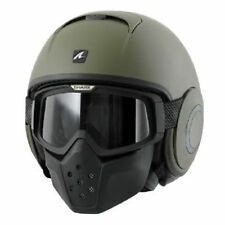 Shark VZ160 Dark Smoke Visor - Skwal / Spartan. 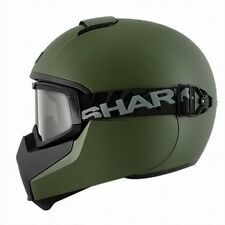 Shark S600 Helmet This entry - level SHARK still provides a high value level of both equipment and security. The SHARK S600 provides a secure gateway into the world of the SHARK brand Thermoplastic Injected Shell Removable Washable Interior Padding Quick Visor Exchange Quick Release Chin Strap Anti-Scratch 2.2 mm Visor Pinlock Prepared Average Weight : 1450 g /- 50 g. 5 Year Guarantee ACU Gold Supplied with Shark Helmet Bag 5 YEAR SHARK WARRANTY. 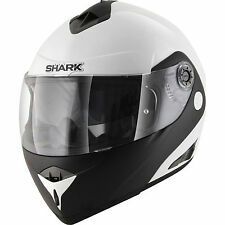 Shark Size Medium Motor Cycle Helmet -NO Reserve!! !